Renovated in 2006, the beautiful art deco Callas Café offers slow service, good coffee and absolutely amazing location- right next to the Opera House. It is a bit touristic worth visiting when you are in the area for a quiet moment. With the diva’s name what other location could’ve have. This outstanding edifice was ommissioned by the New York Insurance Company 1n 1894, the New York Palace was built according to the plans of Alajos Hauszmann, Flóris Korb and Kálmán Giergl. 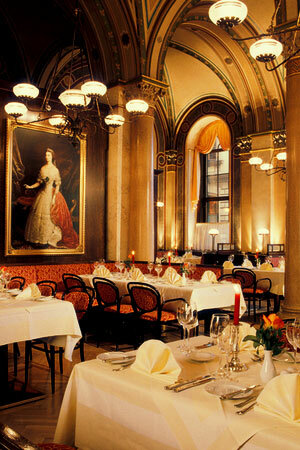 It was recently renovated in 2006 and is part of the Boscolo New York Palace Hotel. The first thing you notice when entering is a large self standing sign, next to the hostess podium, stating “NO PHOTOGRAPHS.’ Why! Everything afterword, other then the decor, consists of a plane, overpriced menu, a stylized pop and jazz soundtrack, and poor service. The room itself is lavish rococo which when renovated, consisted of guilding everything. Except the too modern chairs and tables- which fail to blend into the style in which it was renovated. It’s worth going to see the building and have a coffee to kill the curiosity. If nothing else, the wall sconces outside the door are worth the trip! (photos below). 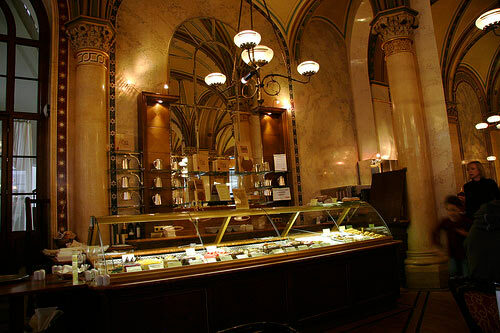 The Café Central was designed by architect Heinrich von Ferstel as a bank. 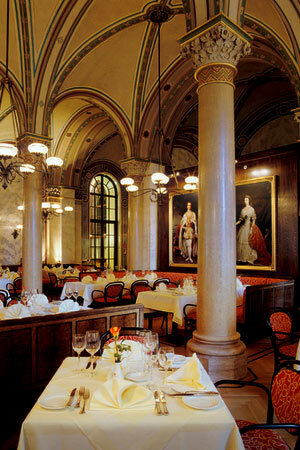 It was converted in to a coffeehouse in 1860 and today finds itself one of the most famous of Vienna’s cafés. Central was a regular meeting place for late 19th century intellectuals when it went by the name Die Schachhochschule. It’s clientell included architect Adolf Loos, Mathematician Leo Perutz and Novelist Hugo von Hofmannsthal. Die Schachhochschule closed its doors at the end of WWII and reopened them after a great renovation in 1975 as the Café Central. Many now categorize it as a tourist trap, but it is worth the visit for it’s architecture and the remarkably conceived pumpkin soup! Two blocks from the Four Seasons Hotel and on the edge of the Vörösmarty Square one finds the medium sized Café Dorottya. Complete with modest decoration, FREE WIFI and the best service in Budapest, Vathy Tamas, son the proprietor, makes you feel at home while he shares information on local activities and Hungarian wine! mmmm. Their coffee selection is one of the better that we have found in Budapest. On weekend evenings, the Café Dorottya turns into a bar, bringing together a mixed crowd of locals and tourists. Girasoles is a moderately priced vegetarian Restaurant and health food store. Girasoles offers complete lunch specials, but you have to arrive early as they run out of food starting about 1:30 PM. It is also a good place to buy groceries, including free range eggs, whole wheat bread and the must delicious sesame seed horchata! If you bring an empty bottle, they will fill it with the horchata, with or without sugar, and the same goes for the daily juice.